Strong and effective law enforcement must not unfairly deprive American citizens of their rights. Many people in the media have jointly arrived at the same talking point. They say that criticizing the bad actions of specific people at the top ranks of a law enforcement agency mean you’re at war with all law enforcement. TV pundits and hosts have used the same talking point. It’s a convenient way to avoid talking about abuses revealed by congressional overseers in a recent memo filled with facts not in dispute by the FBI. Note the big picture, headline, and story in the center of the front page, above the fold of the newspaper. The story, “Molested as F.B.I. Case Plodded for a Year,” dramatically details serious problems at the FBI that led to the sexual abuse of dozens of girls. In Sunday morning’s New York Times newsletter, it was the top news story. It says the FBI’s inquiry into horrific abuse of young girls by an athletic doctor “moved with little evident urgency” and that the result was 40 girls who said the doctor molested them during the time of the inquiry. Some are among the youngest of his 265 accusers. The critique of the FBI’s handling of an investigation is heartbreaking. Families who reported abuse waited a year to be interviewed by the FBI. Problems stretched over multiple offices and locations. 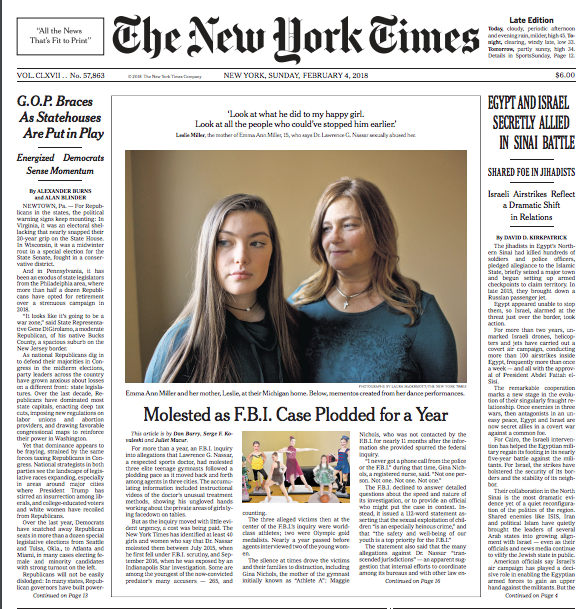 No reasonable person would think that highlighting problems at the FBI as it relates to inquiries into the abuse of children means that The New York Times is at war with the FBI. The paper might be neutral about the FBI, but an argument could easily be made that the paper’s emphasis on rooting out delays and mismanagement there improves law enforcement at the agency, not hurts it. We can criticize the FBI, but if you do it, you are at war with law enforcement. The report, which is causing alarm for millions of Americans who are not inside newsrooms or otherwise obsessed with destroying Donald Trump, is based on a lengthy investigation. It shows that the FBI took information it knew originated and was funded by the Hillary Clinton campaign and the Democratic National Committee to secure a wiretap on a Trump campaign affiliate. The report says the FBI hid the provenance of the information from the court, claimed it was corroborated by citing a news article that was itself sourced to the same campaign operation, and declined four separate opportunities to be truthful about this. The memo further says that the author of the document was biased in the extreme against the target of his dossier, was terminated for dishonesty from working with the FBI, and that the document was unverified throughout the wiretapping process. The memo further details how a high-ranking Department of Justice official was funneling information from his wife, who was also paid by the Clinton campaign operation, but that this information was also withheld from the court that granted the wiretap. Apart from the House Republican memo, at least six people at the FBI and Department of Justice have been demoted or fired for mishandling their duties, including the above high-ranking official Bruce Ohr, a chief investigator of the Russia probe Peter Strzok, and the FBI’s deputy Andrew McCabe. Republican leaders’ open defiance last week of the FBI over the release of a hotly disputed memo revealed how the GOP, which has long positioned itself as the party of law and order, has become an adversary of federal law enforcement as the party continues its quest to protect President Trump from the Russia investigation. The FBI, the Justice Department and other agencies are now under concerted assault by Republicans, facing allegations of corruption and conspiracy that have quickly moved from the fringes of the right into the mainstream of the GOP. I somehow don’t remember the Washington Post or other newspapers disparaging the victims of abuse at the hands of Catholic priests as hypocrites because they faithfully attend or attended Mass. I don’t remember them worrying about institutional power as they took on the powerful church and gave themselves awards and made movies out of their valiant struggle. I don’t remember them disparaging the notion of widespread abuse as a fringe conspiracy theory. Funny, isn’t it. Being for law and order does not mean being for any abuse of authority that you come across any more than being a faithful Catholic means tolerating institutional rot in that church. How many movies are made that feature a bad cop? Does this make these movies anti-cop? Frequently the people fighting the bad cops are also cops. Speaking as someone who has worked on this abuse of power story for more than a year — here’s one of my first articles from January 2017, headlined “Top Level Intel Officers’ War On Donald Trump Is Bad For The Country” — the vast majority of my sources and contacts for stories about abuse of power in law enforcement and intelligence agencies are themselves currently or formerly in law enforcement and intelligence. They’re not only not at war with their agencies, but proud of them and strongly interested in their reputations. Support for law enforcement that doesn’t care about abuse of power is not support of law enforcement at all. Law enforcement is one of the most powerful professions around. We allow law enforcement officers to deprive citizens of their freedom, their privacy, and their property. We authorize them to use physical force against citizens. We attempt to require law enforcement officers to follow strict rules and guidance governing their actions, and we monitor the abuse of these powers against citizens. When cops, law enforcement, or intelligence agents misuse their power, we attempt to root it out and punish it. This is important for the morale and others’ good judgment, and for the trust that the people should have in institutions of authority. For Foreign Intelligence Surveillance Courts, it’s even more important that the government be beyond reproach. That’s because these courts are secret and the targets of the court’s decisions do not have representation, by nature of the secrecy involved. Our government is required to present information fully, so the American citizens who are deprived of their rights are not targeted unfairly. Failing to include information that any reasonable judge would need is a violation of civil rights. Apparently some in the Twitterverse and in the media think it’s fun to laugh that off, but being deprived of life, liberty, or property because a court that gives you no right to defend yourself didn’t receive all the relevant information is not funny. To mock the push for transparency, accountability, and protection of civil liberties as a “war on law enforcement” is scandalous and untrue, and it must stop. It is a stupid argument made by partisan hacks. The media may think it’s okay to disparage attempts to hold the FBI accountable because all rules are off during the Trump era, but they are wrong. They may think they’re just mocking Trump, or many people’s representatives in Congress, but the message is heard also by the tens of millions of other people who believe the government should not unfairly deprive American citizens of their rights. For a media class that says it cares so much about democracy not dying in darkness, and the rules and norms that hold civil society together, they sure have an interesting way of demonstrating that.